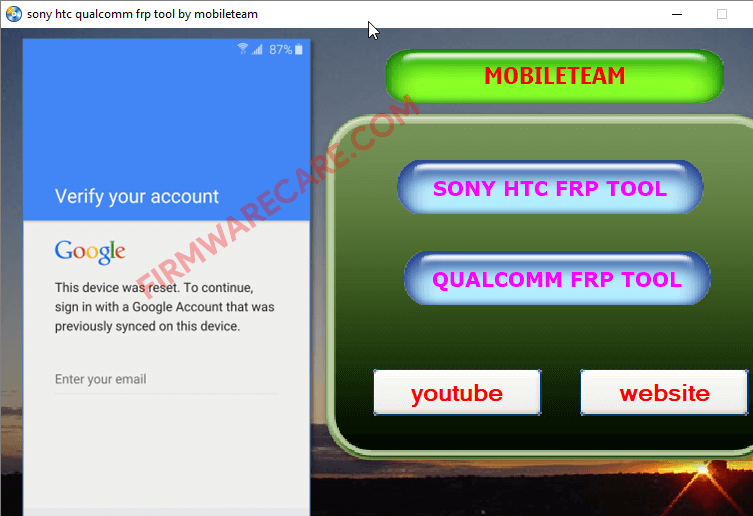 Sony HTC Qualcomm FRP Tool is a small application for windows computer created by Mobile Team, which allows you to remove or bypass the FRP Protection from your Sony and HTC devices quickly with its simple and user-friendly interface. FRP is a security method implemented by most of the mobile phone manufacturing companies to make sure someone can’t just wipe and factory reset your phone if you’ve lost it or it was stolen. By using Sony HTC Qualcomm FRP Tool, you can easily remove this protection from your devices. It supports almost every model of Sony and HTC devices running on qualcomm chipset. In order to use the Sony HTC Qualcomm FRP Application, you need to install the Universal ADB Driver on your computer. [*] Compatibility: The Sony HTC Qualcomm FRP Application runs perfectly on Windows XP, Windows Vista, Windows 7, Windows 8, Windows 8.1 and Windows 10 (32 bit and 64 bit). [*] Credits: Sony HTC Qualcomm FRP Appliation is created and distributed by Mobile Team (developer). So, full credits goes to Mobile Team (developer) for sharing the tool for free.